Last chance to snag these cute Spring Basket with 6 Hatchimals CollEGGtibles for $14.99 (Retail $19.99). •Ombre eggs! Pastel colours! Exclusive characters! There's so much hatchifun inside the Spring Basket! With four in-egg and two out-of-egg characters, it's the perfect edition to your collection! •Hatch your CollEGGtibles, then peel your egg down to the wavy line at the bottom! Throw away the top pieces and now you have a cozy nest – the ideal place to display your adorable friend! 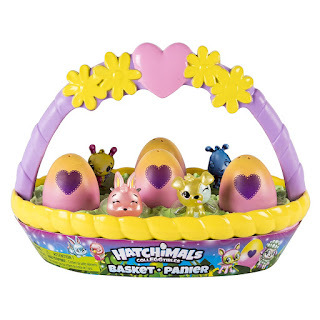 •Inside the Spring Basket are six exclusive Hatchimals CollEGGtibles and 8 nests! That means there's room for more of your friends! Now you can play and display your CollEGGtibles!